Recuerdos (memories) is an ever-evolving experiment in emotional nuance that pays homage to the people that call San Antonio home. Told through performance poetry, live instrumentation, and audio/visual media. Recuerdos was originally conceived of as a multi-disciplinary collaboration between nationally recognized visual artist, Vincent Valdez; performance artist, Nicolás Valdez; and Say Sí theater program coordinator, Joel Settles. 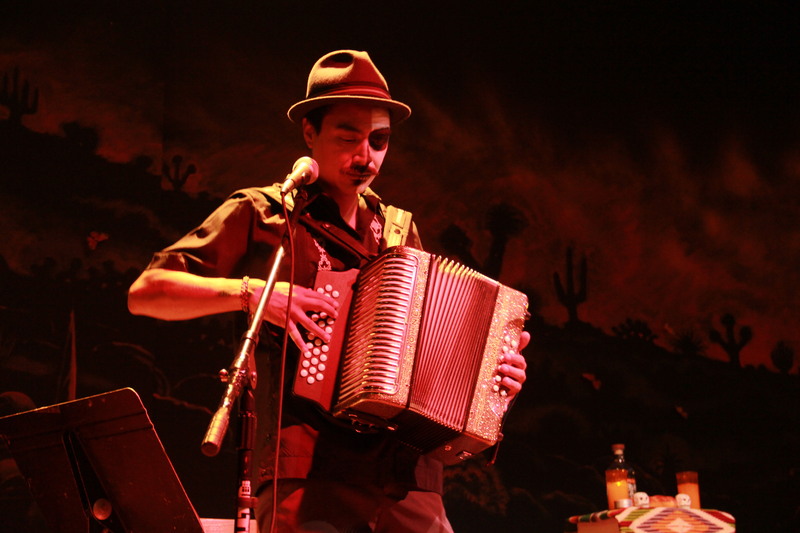 Recuerdos made it’s premier at the Say Sí Muertito Fest in 2010, and performed again at Say Sí in 2013 and 2014. Most recently, Recuerdos was performed outdoors at (former-San Antonio Poet Laureate) Carmen Tafolla’s event, Yanaguana: Blessings of Our Beginnings at San Pedro Park. Opening the performance is a ritualistic blessing of the stage already set with soft, colorful lighting and a full screen visual of the San Antonio skyline. Here then the stage becomes it’s own alter where figures (family, friends, artists, activists, etc. ), ghost-like, appear in the night sky. As the performance progresses, interwoven with music and poetry, so does a full moon that arches slowly across the screen, disappearing at its apex, representing the other side of our cosmic cycle where our eyes do not penetrate. Another central figure in this heart-felt production is an antique radio, highlighted during transitions, that relates it’s own historical narrative through the music it draws up from the past. Along with audio interviews, and the live performance by Nicolas, all these various elements come together harmoniously to create a living landscape of memories and dreams (and stories still unfolding), that takes the audience on a poignant journey into the spirit and soul of SanAnto. Intended to be adaptable to various locations and to include local collaborations, Recuerdos continues to evolve beyond a story of just SanAnto, but as a reflection and celebration of the lives, the struggles and the achievements of the people that make our space in the world a home.